Employers: Are you prepared for Single Touch Payroll? In less than a month, many employers will start reporting to the ATO in real-time from their payroll software each time they pay their employees. This change, known as Single Touch Payroll (STP), means employers will send tax and super information to the ATO electronically when they run their payroll. This includes their employees’ salaries and wages, pay as you go (PAYG) withholding and super information. ATO Assistant Commissioner John Shepherd said employers with 20 or more employees need to plan for STP before 1 July. Some payroll software providers have been given a later start date (a deferral) by the ATO which covers their employer clients. “Ask your software provider if they have a deferral from the ATO and check it applies to the software version you’re using. If they do, you’ll start reporting on or before that deferral date – not on 1 July. “If your software will be ready by 1 July, but you need more time, apply for your own deferral using our online form. You’ll need to make sure you provide us with the right information,” said Mr Shepherd. Mr Shepherd said a key part of getting ready is making sure payroll information is correct and up-to-date and the right people in a business know about STP. “Even if you have a deferral, use our Get ready for STP checklist to make the most of your time now before you start reporting,” Mr Shepherd said. 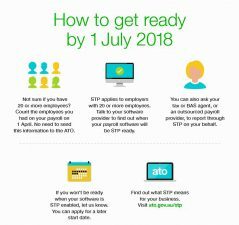 Employers can visit ato.gov.au/stp for more information including a fact sheet, checklist, detailed technical guidance on information to report, along with helpful videos.